Put a whole new spin on drawing, tracing, designing or animating with the New LightPad Revolution light box. A new tool for artists, designers and animators. 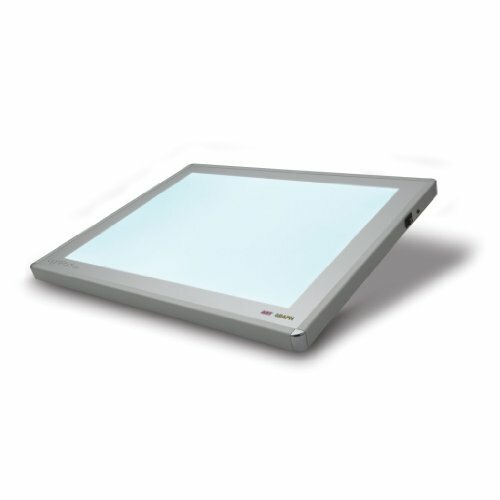 This unique revolving light box provides artists the option of conveniently rotating their project for more comfortable and accurate tracing or designing. The rotating disc can also be locked in place with the included exclusive Disk-Brake – securing any project from unwanted movement for detailed drawing or lettering. A 5⁰ indexed disk guide around the disk allows for precise measurement. The maintenance-free (50,000 hrs.) Super Bright LEDs provide a brilliant, energy efficient and cool tracing surface, suitable to trace through 300 lb. water color paper.